What Do I Need to Know About My Spa Pump? When we get calls from customers looking for help, we get more calls about spa pumps than anything else we sell. There are a few things you should know about your pump that will help you when trying to restore/ replace it. A very common problem in older spas is the failure of the hot tub pump. Restoring your pump can give you many more years of enjoyable use out of your hot tub. First of all let’s start with the anatomy of the pump. The pump has two main parts the “wet” end and the “dry” end. The pumps wet end houses the impeller which moves the water; the dry end houses the electric motor which moves the impeller. As these two parts are separate it is possible to replace just the wet end or the motor, however if your entire pump is more than 2-3 years old we recommend replacing the entire thing. Replacing the entire spa pump will save you headaches in the future. If you are going to replace the entire hot tub pump there are a few things you will need to know when looking for a new pump. 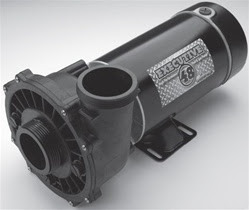 · What is the horsepower of the pump that you are replacing? Although you can use a different horsepower pump than what was originally used, it would change the pressure of the water flow coming through your jets. When the manufacturers choose a pump they base the horse power on the number of jets being serviced. It is recommend that if you choose to use a different horsepower that you do not increase by more than one level. Therefore increasing from a 4 HP to 4.5 HP, or 2 HP to 3 HP, should be okay but you would not want to go from a 1 HP to a 4 HP, as this could cause you problems later on with your equipment. · What is the speed of the pump? Generally your pump is either going to be a 1 speed or a 2 speed. If you cannot locate the speed on the pump you can tell by how the pump normally supplies water to your jets. If you push the button once do your jets come on low and then pushing it again takes them to a higher speed? If so this would be a 2 speed. If you are still not sure check the AMPS listed on the pump, if only one number is listed chances are you have a 1 speed, if two numbers are listed, it most likely a 2 speed pump. · What is the frame of your pump? The “frame” means where do the bolts fit that attach the wet end to the motor. Most of the time you can find the frame listed on the label as either 48 or 56. Often with an F indicating that is the “frame” size. If you cannot find an indication of frame size you can measure between the thru-bolts on the pump. A 48 frame will be less than 4 inches between the bolts; a 56 frame will be more than 4 inches between the bolts. · What is the voltage of the pump you are replacing? The best way to know this is to consult the label on your current pump or your hot tub’s owner’s manual. This is important to check because not all spas that are wired for 240V use 240V pumps some only use 120V pumps. · The last thing you need to determine is what is the size of the plumbing in your spa? Both the plumbing that takes the water into the pump and the plumbing that takes the water out of the pump. It is common for people to get confused here and want to measure the size of the hole on their wet end---DO NOT do this! You need to look at the PVC pipe within your spa and see what the diameter of the pipe is. This is the size that you will want to use when finding a pump or pump fittings. Most spas will be the same size for both the intake and outtake pipe but be sure to double check just in case yours is one that is not. After determining all of this information about your pump you are now ready to shop for a replacement. Here at Hot Tub Warehouse we have a large selection of replacement hot tub pumps and any other spa parts you may need.